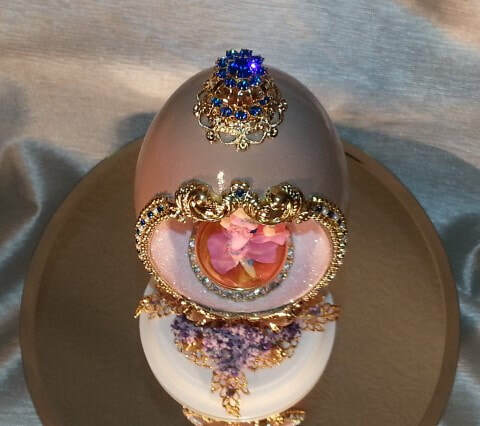 The Golden Age of Hollywood is captured in this Rhea egg design. 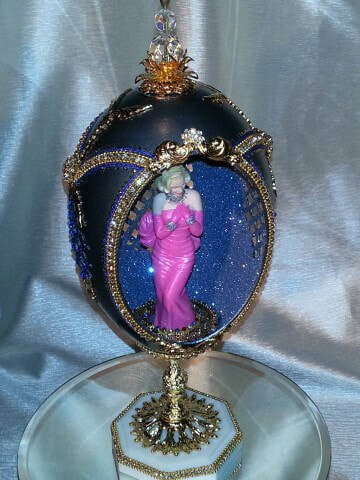 A small digital picture player designed into the theme of this egg captures highlights of the old Hollywood movies. 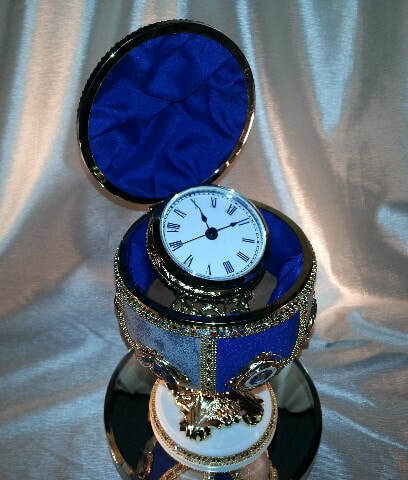 The design gives you the feeling of an old Hollywood premier. 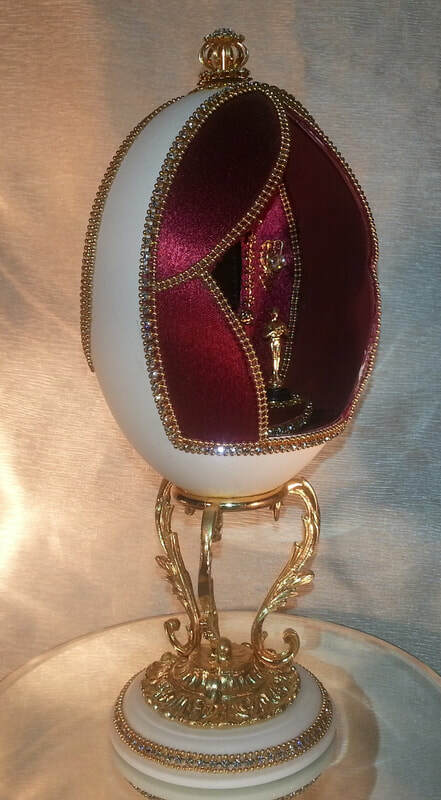 Inside the egg is a stage that holds a camera and a replica of an academy award statue. 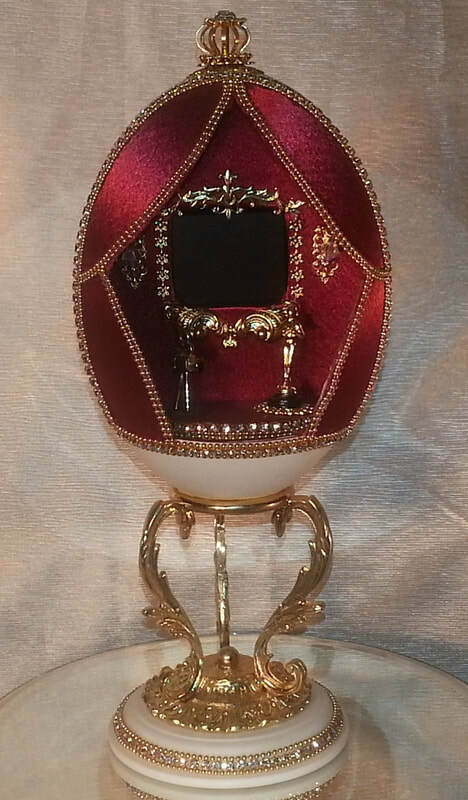 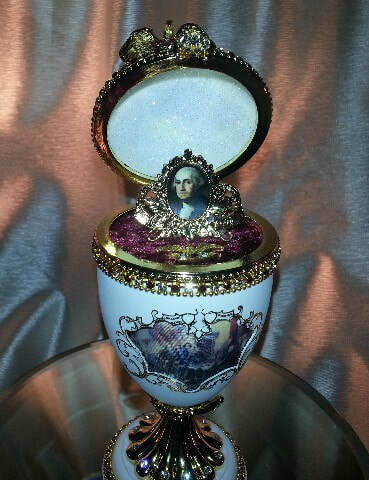 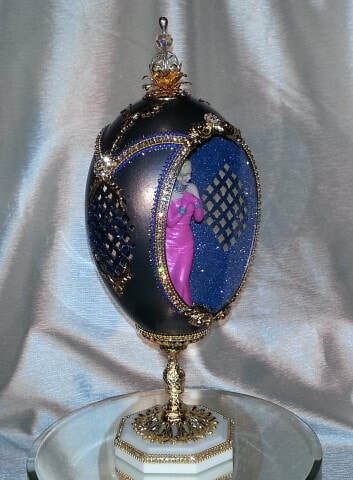 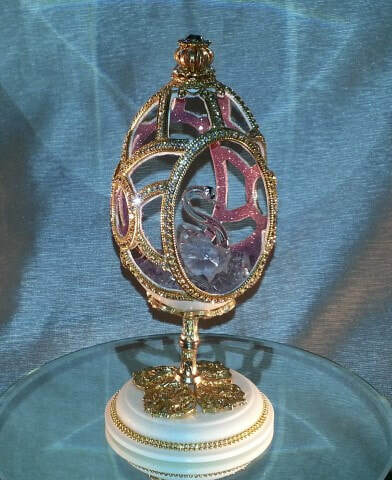 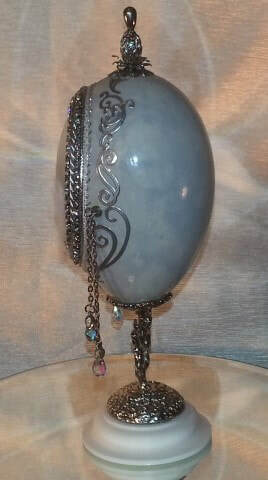 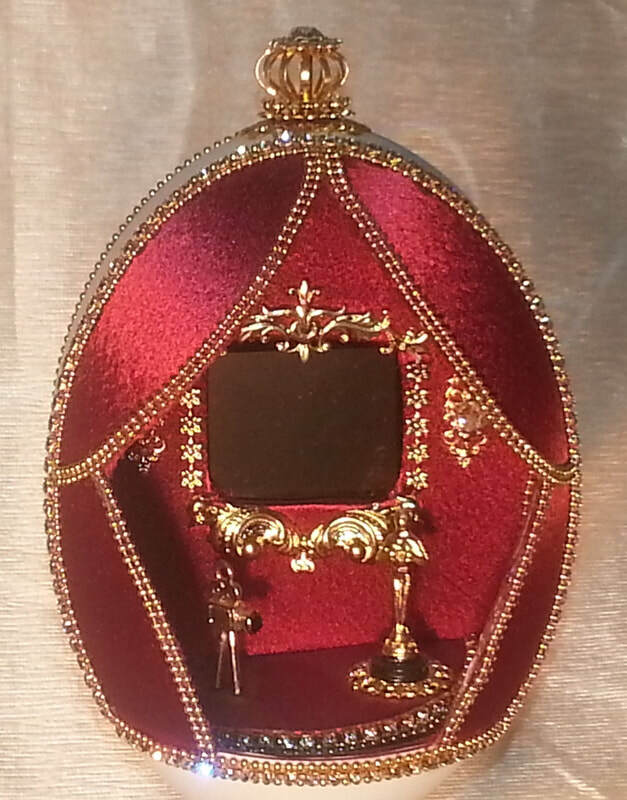 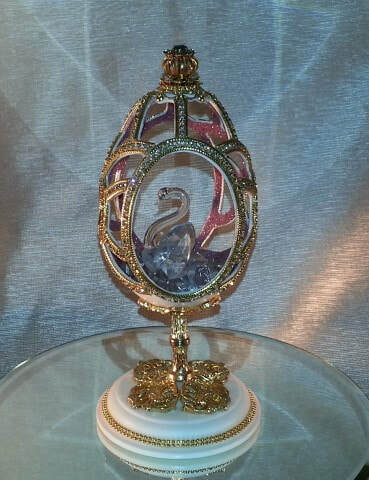 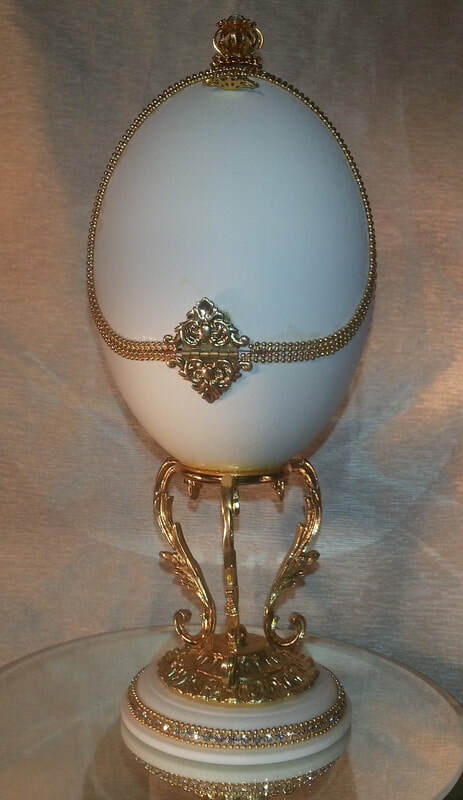 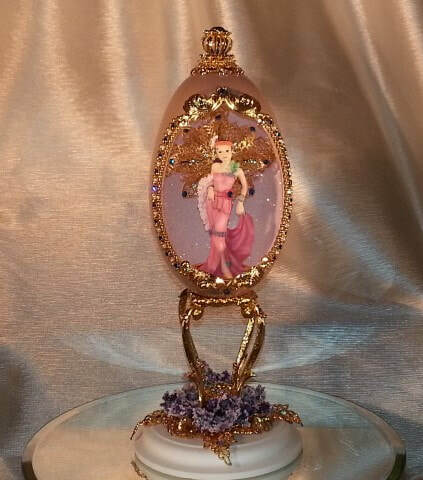 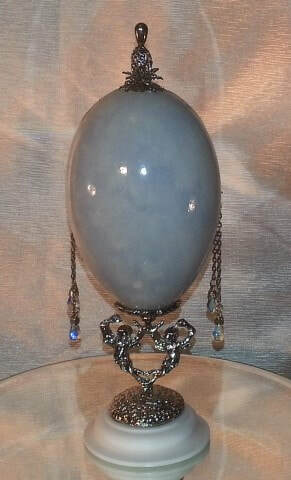 The outside of the egg is framed with red satin and Austrian Crystal and gold bead chain. 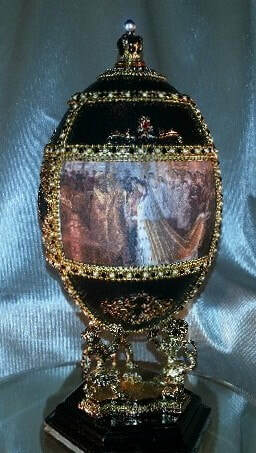 The digital picture player is concealed into the back of the egg, which open up for downloading new themed pictures. 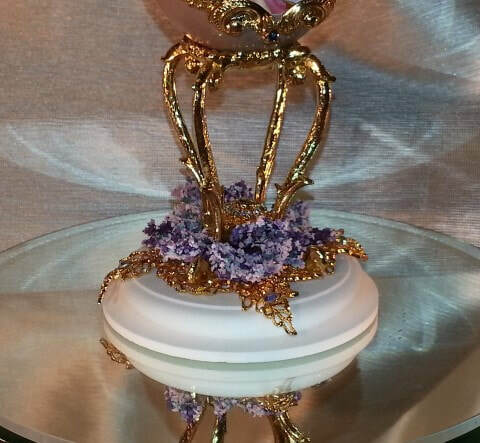 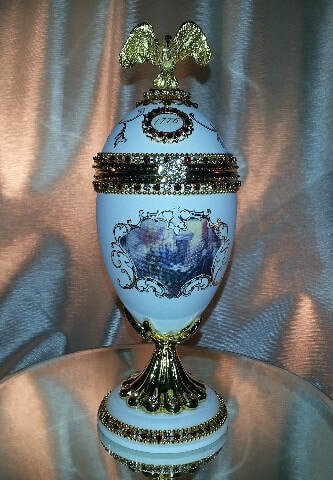 Our egg design is supported by a gold plated stand and jeweled Corian base. 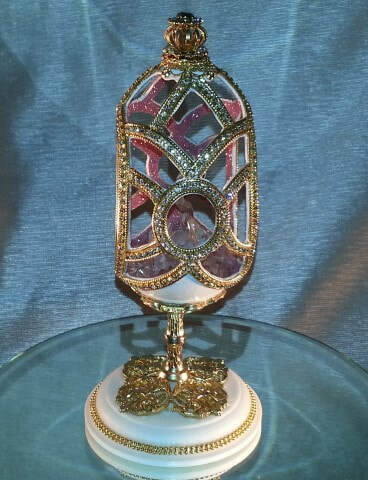 The digital player plugs into your computer using the USB cord that is included to recharge your player. 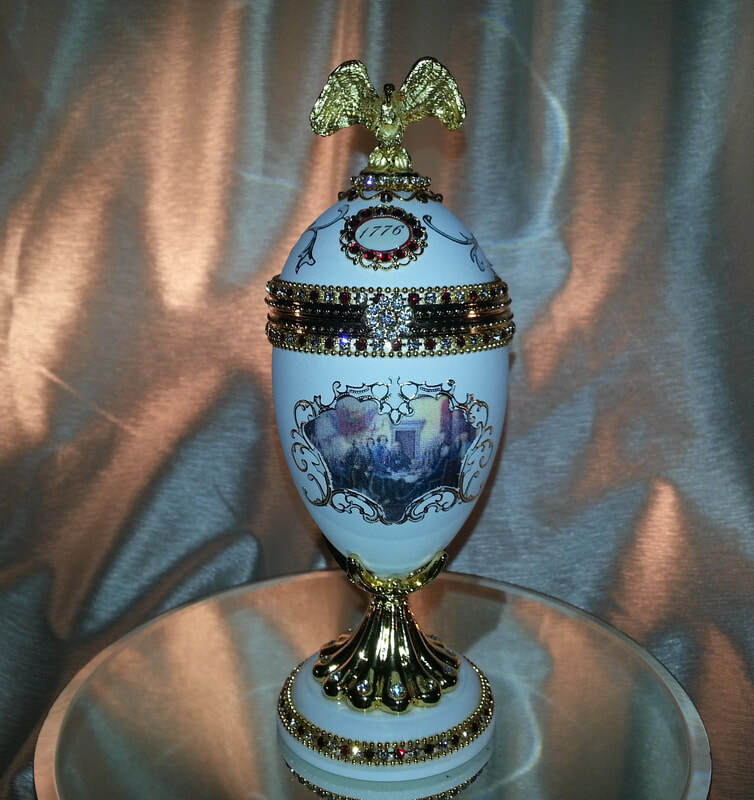 Pictures can be changes out at anytime by downloading new ones. 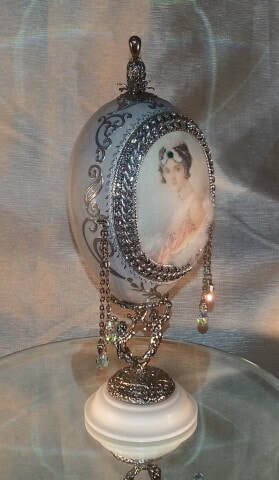 Theme can be changed for wedding eggs, capture your favorite wedding pictures into a custom egg design. 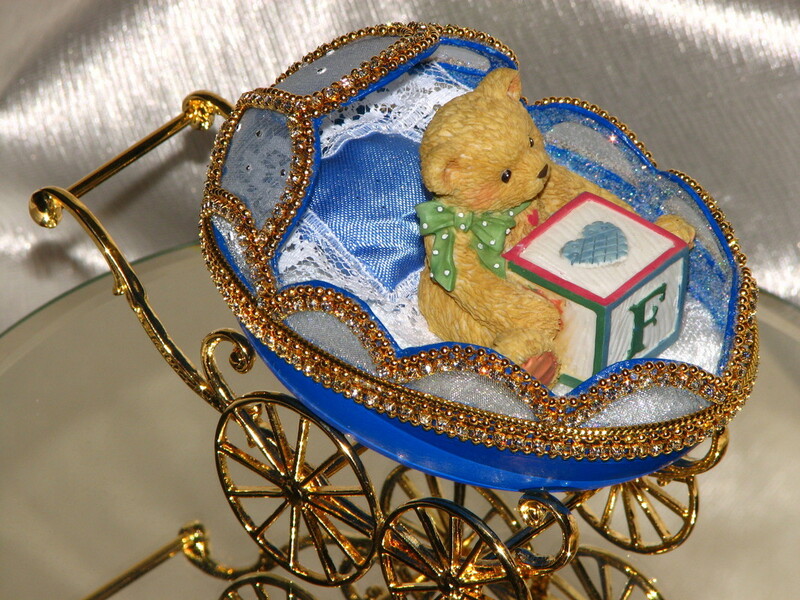 The picture player can hold up to 48 pictures. 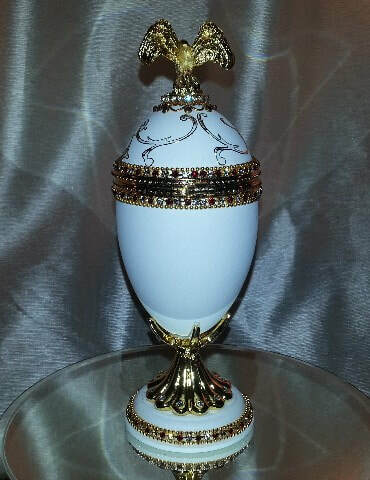 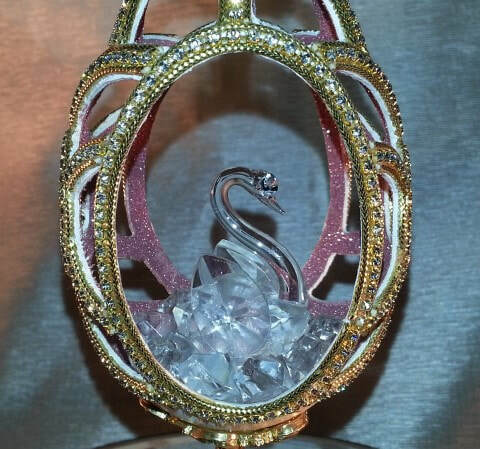 A rich and elegant Rhea egg is designed as a tribute to the pageantry and intrigue of Nicholas II and Alexandra, the last Czar of the Russian Empire. 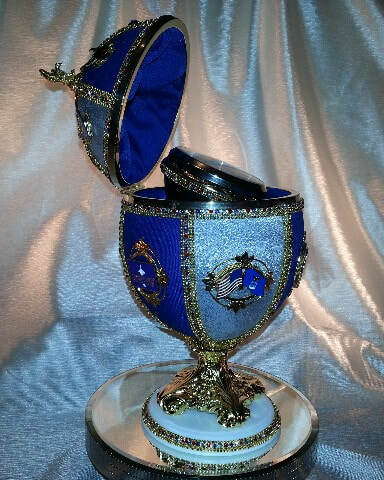 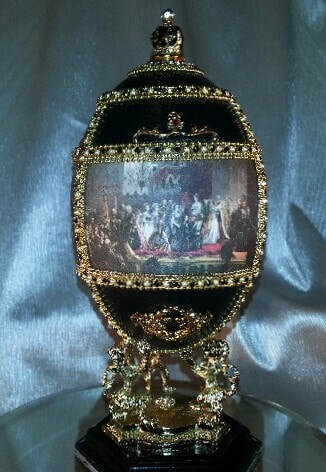 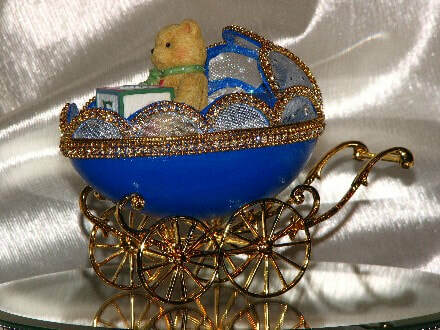 This egg captures the magnificent coronation of the Czar of Russia. 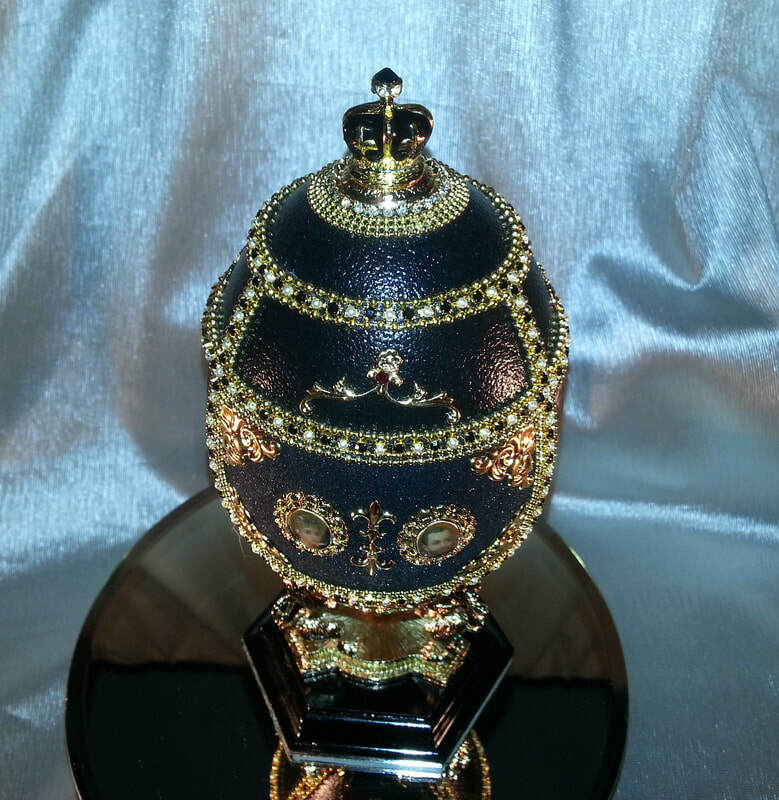 A Jet black and crystal Austrian chain and gold filigree is used on this design to frame different scenes. 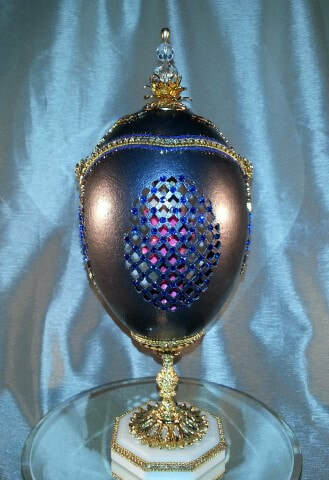 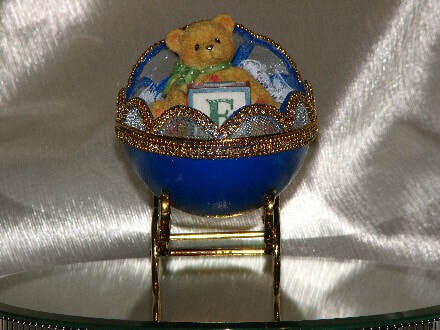 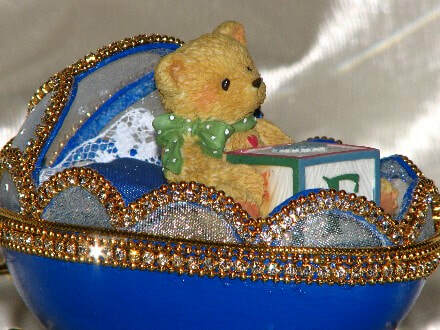 The egg is completed with a unique gold plated lion stand and crown finial. 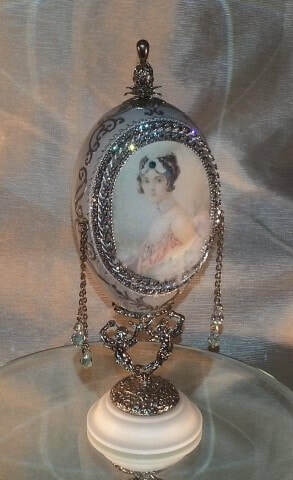 8 1/2" high by 4 1/2" wide. 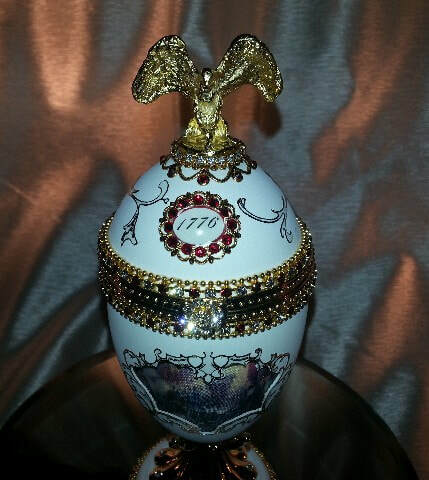 ​This Ostrich egg design is a tribute to our men and women of the armed forces, with a working clock inside. 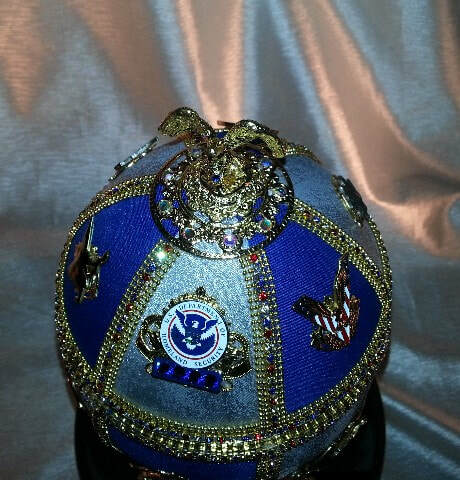 Each panel has a pin or medal from a certain squadron or unit from the military. 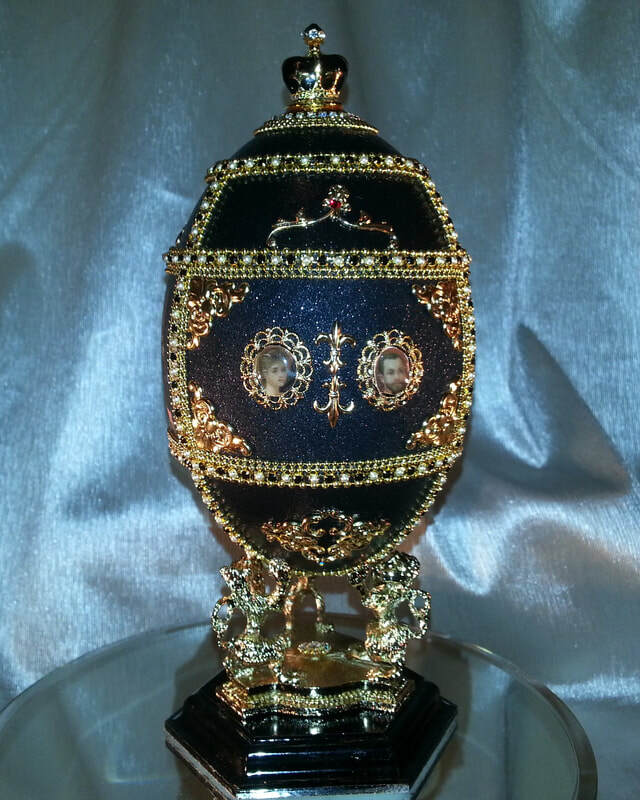 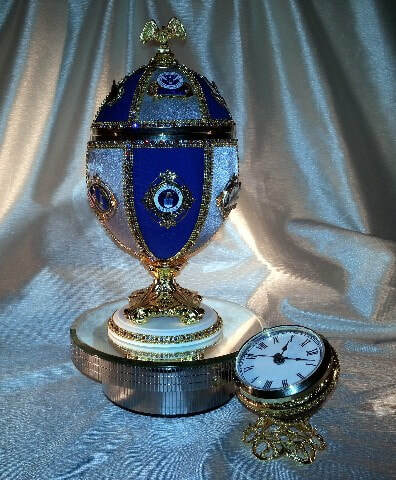 Inside the egg is a working clock inside another egg shell and supported by a gold plated stand. 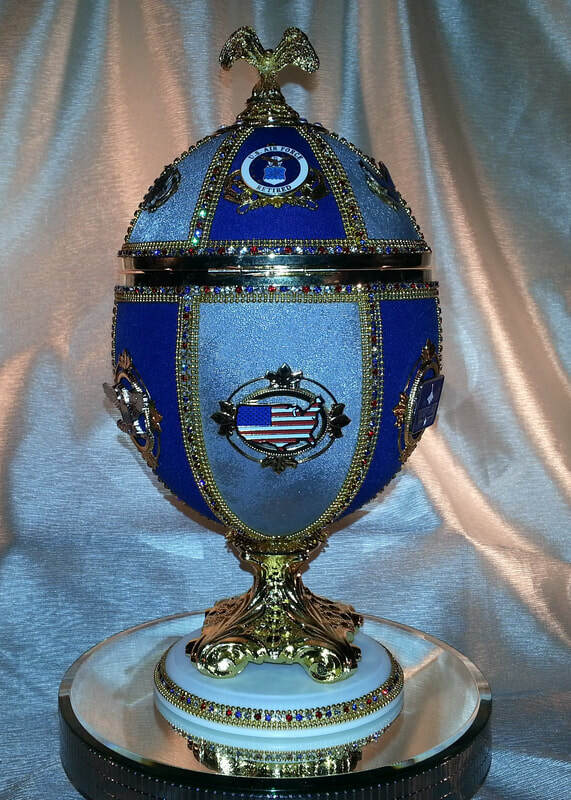 This egg can be designed with someone's entire military career in the armed forces and give them something special to cherish for many years.